This is the fourth and final part of “Granada in under 1,000 words”! Crazy stuff. "It's a hard knock life, for us"
So not complaining. Anyway, onwards and upwards! I’m going to start this by saying this: FLAMENCO IS INCREDIBLE. Okay, now that I got that out, I’ll explain what it is. Flamenco is a form of Spanish music and dance. It actually originates from Andalucía, the region of Spain that Granada is in. It traditionally includes singing, guitar, dance and handclaps. 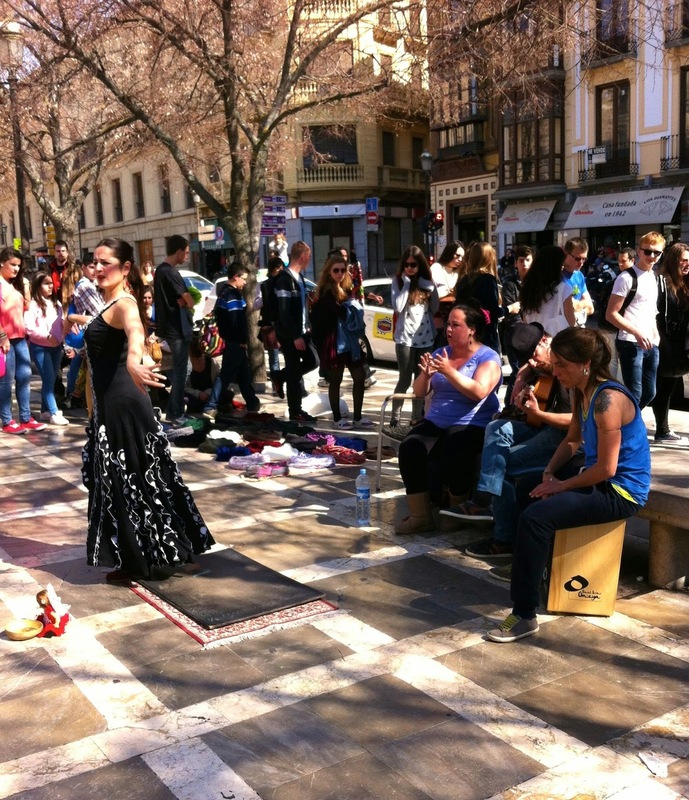 A public flamenco performance in Plaza Nueva, Granada. 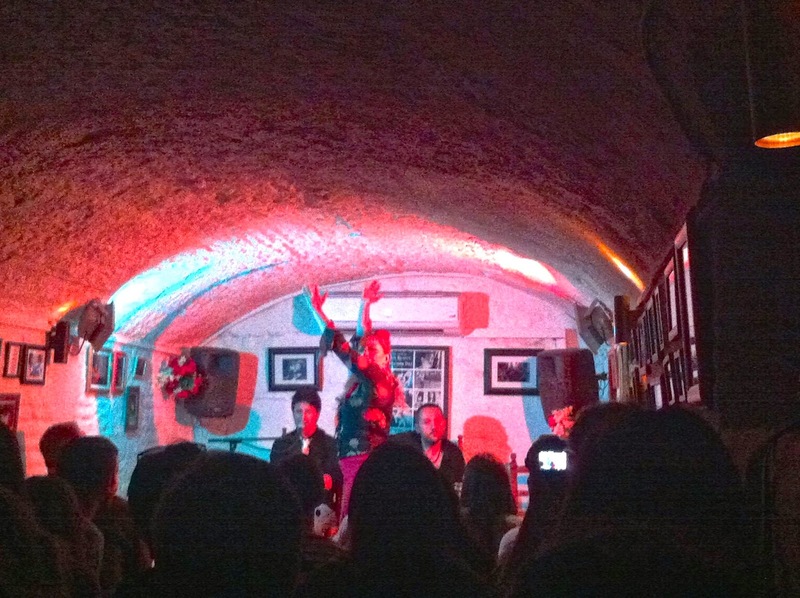 There are different settings that flamenco can occur in. The “juerga” is a spontaneous, relaxed gathering, similar to a jam session. I’ve seen Flamenco groups busking in the plazas of Granada, so I’d assume they would fall into this category too. 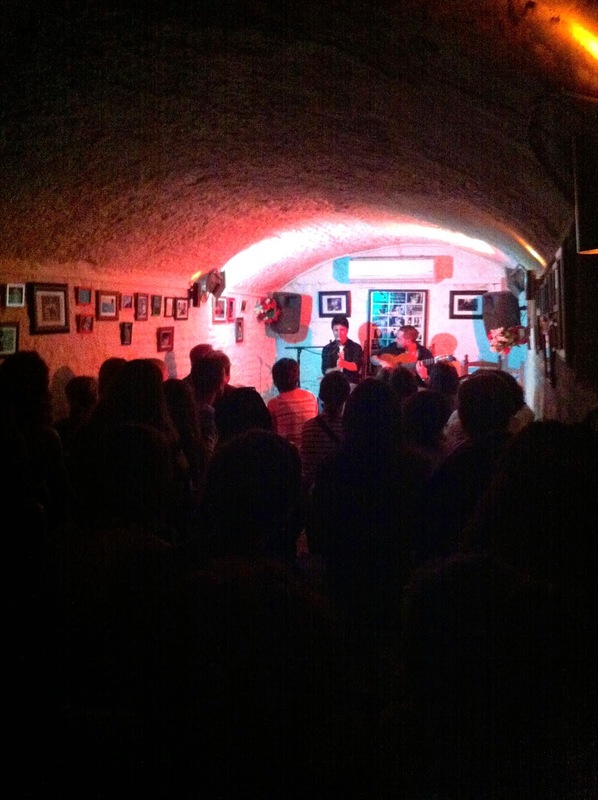 “Tablaos” are slightly more formal establishments where flamenco is performed. They usually serve drinks during the performances. Lastly, there is the theatrical presentation of flamenco, which centered much more around the dance side of things, similar to a ballet. 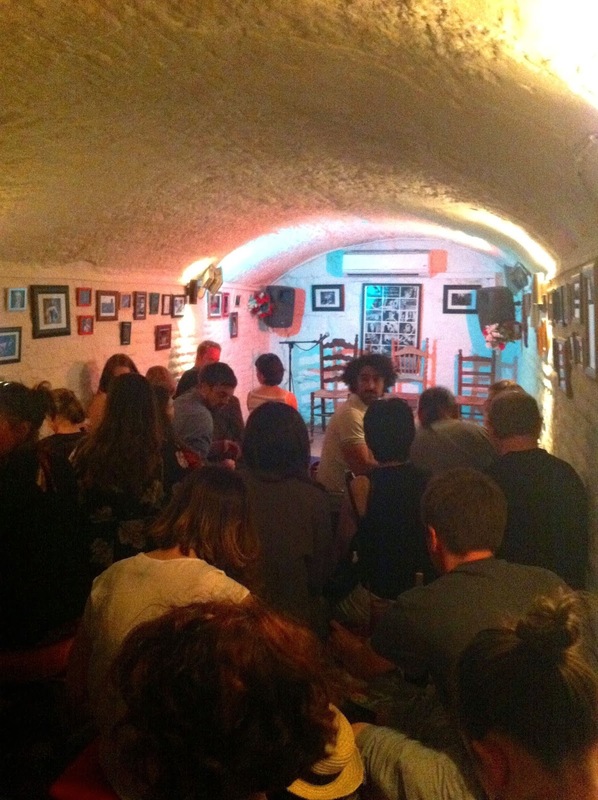 Before the show - flamenco is traditionally performed in a cave-like room. I first saw a flamenco show at the start of June in a tablao in Granada called “Le Chien Andalou” (The Andalusian Dog). The group was made up of three performers: a singer/ hand-clapper (the word sounds better in Spanish - palmero), a guitarist and a dancer. The two musicians performing the amazing flamenco music. The first three songs were performed only by the two musicians, no dancing. I really enjoy the flamenco style of music but I have to admit, I enjoyed it with the dancing a lot more as it all comes together. The flamenco dancer joined the other two on stage for an incredible performance. The thing that really struck me about flamenco is that it’s so full of emotion. The emotion is shown through the singer’s voice, and even more so through the dancer’s facial expressions. Performers of flamenco are exceptionally talented, and watching a live show made this even more apparent and really took my breath away. Flamenco is influenced by many cultures such as Islamic, Andalucian, gypsy, Sephardic and Arabic. There are over 50 different types of “palos” (music styles of flamenco), yet most of them are hardly ever performed. The dancing costumes vary, but women traditionally wear black, deep blue, red or white dresses (called “Bata de Cola”), a shawl and high heels specifically designed for flamenco. In 2010, UNESCO declared the art of flamenco as “the masterpieces of the oral and intangible heritage of humanity”. Traditionally, young flamenco dancers are not considered perfect, as they don’t have the emotional maturity it takes to perform the soul of the genre. The older they get, the more “perfect” they are considered. Sierra Nevada from my street in Granada. 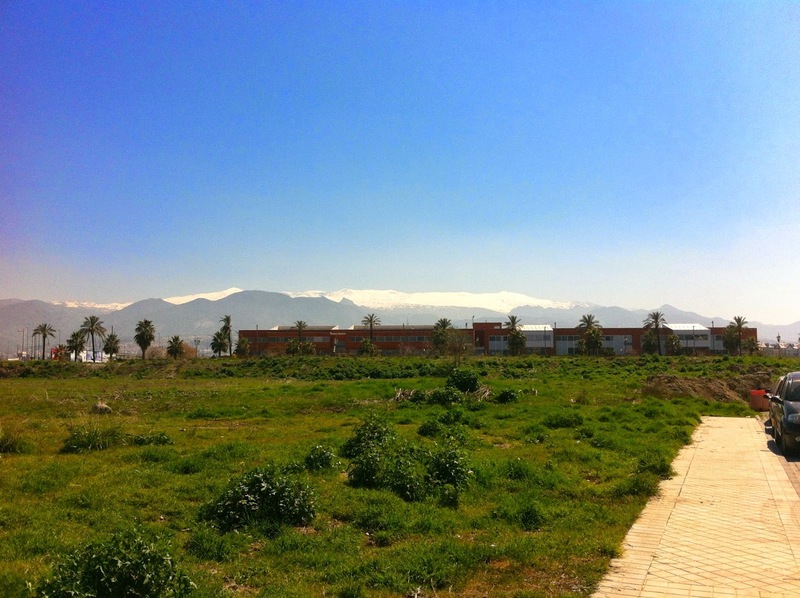 Sierra Nevada is a large mountain range located right by Granada. It’s rather appropriately named as Sierra Nevada means “snowy range” in Spanish, so props to whoever was in charge of naming mountain ranges that day! It homes the highest point of continental Spain, Mulhacén, at 3,478 metres above sea level. Part of the ski field from the top. 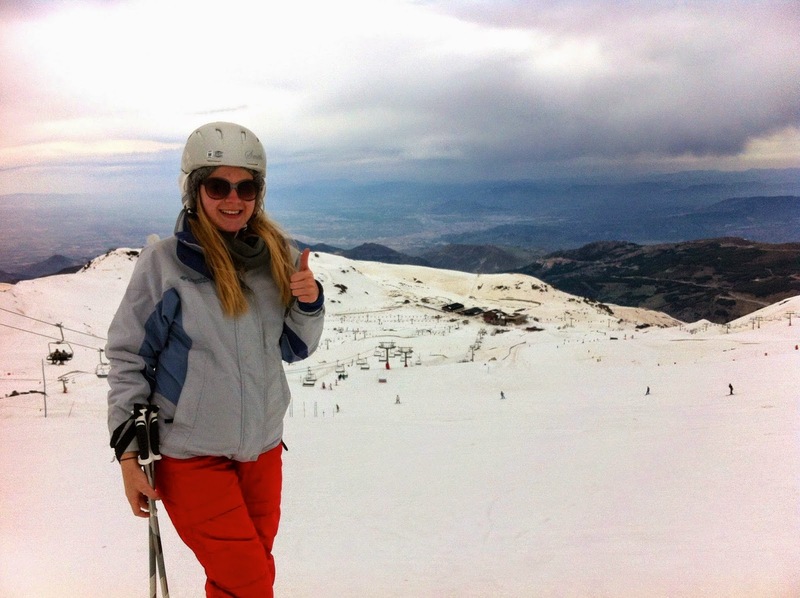 The mountain range has a wonderful ski field 30 minutes drive from Granada, which claims to be Europe’s sunniest with over 80% of days being sunny! Unfortunately, the one day I went, it was cloudy and windy. Ahh, the irony. 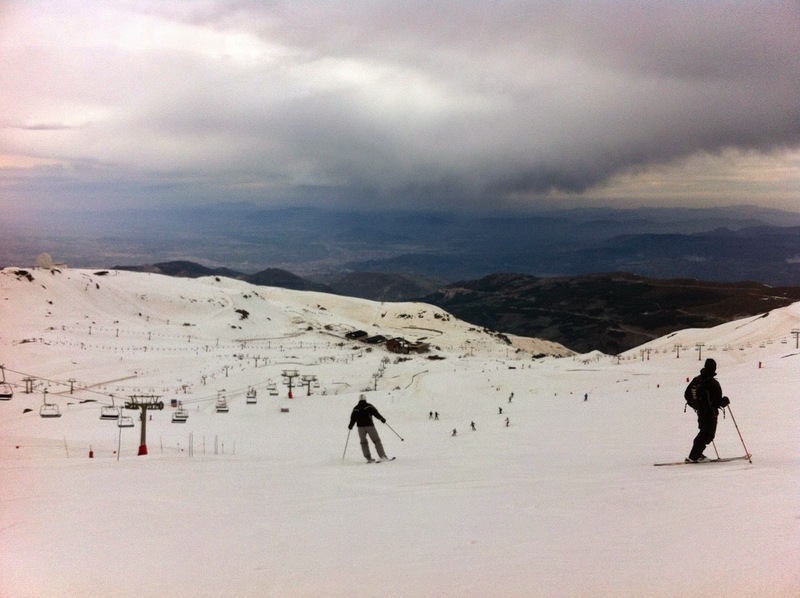 I went in mid-April, towards the end of the skiing season, so the snow wasn’t the best but it was still a great day. Just me looking a bit like a bug, lovin' it. One of the coolest things, I think, about Granada is that 30 minutes drive in one direction will take you up a mountain to a ski field, and 30 minutes in the other direction will take you to the coast, where you can go to the beach. Best of both worlds, huh? 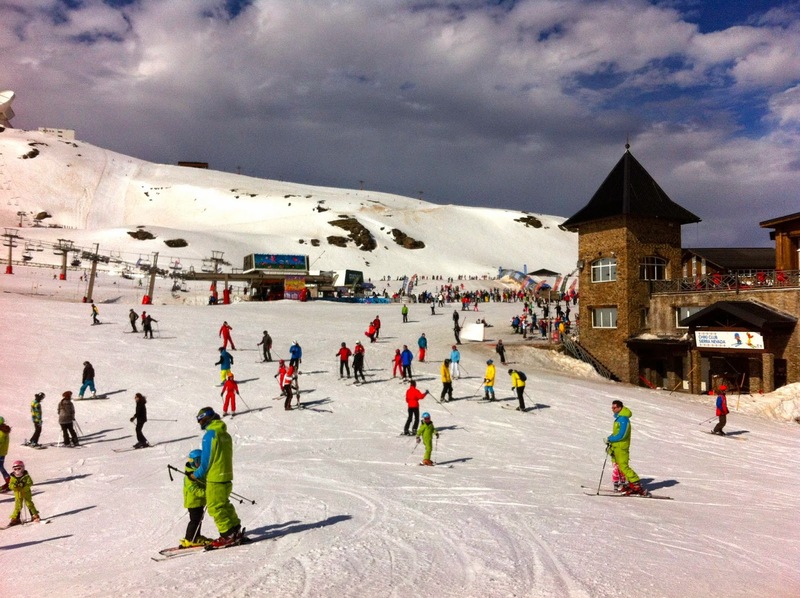 Sierra Nevada is also popular in the summer for hiking, horse riding and biking, with many lagoons and trails to explore. Around halfway up the ski field, where the gondola drops you off. Well, that brings us to the end! I really hope you’ve enjoyed learning a bit more about the fabulous city in which I live. In my next post, I will talk more about my personal experience so far with being an au pair.